As you drive down Marconi Road in Wall, it's almost startling to see a military-grade satellite dish on the side of the road, across from a Little League field. Travel a bit further, and you'll see a tall antenna marked with a sign denoting it as Marconi property. Neither device has received signals for many years, but they still stand as important symbols of the site's contributions to the science of communications. Once part of the larger nearby Fort Monmouth, the former Camp Evans has been transformed into the InfoAge Science History Learning Center and Museum. That mouthful of a name doesn't even begin to represent the diversity and magnitude of the stuff there. In fact, it's hard to find a place to start describing it. Ivan and I visited on a recent rainy Sunday afternoon, and it soon became clear that the roughly three hours until closing might not be sufficient to explore the whole place. Since the town of Wall received the property from the U.S. Army with the intent to preserve its history, a band of dedicated volunteers has been working to tell the story of military and commercial information age technology in the environment where some of it was developed. The result is an interesting patchwork of exhibits and artifacts diverse enough to interest everyone from technology geeks and TV/radio enthusiasts to military history nuts and curious kids. While there's still a lot of work to do to transform the former base to a polished learning center, I could definitely see how a receptive student could find inspiration there for a lifelong passion for technology. 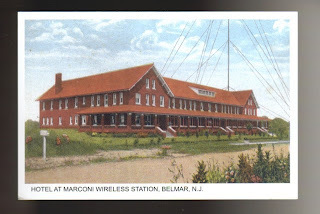 The site itself got into the communications business just about 100 years ago, when the American Marconi Company built its Belmar wireless receiving station there. Paired with a high-powered transmission station at New Brunswick, this facility picked up the weak transatlantic radio signals from other Marconi stations as part of the inventor's worldwide communications network. As was explained to us, the building that now houses the exhibit was known as the "hotel," housing the wireless operators who provided 24/7 monitoring of the airwaves. The U.S. Navy confiscated Marconi's operations during World War I, marking the first time the property was used for military purposes, but it seems that the site's greatest contribution to our nation's defense occurred during World War II. Evans became one of the Army Signal Corps' top communications research facilities, developing improvements to radar technology that were acknowledged by several Axis-power military officials as contributing to the eventual Allied victory. After the war, American researchers were joined by former German scientists who had been working on similar technologies for the Nazis. Their contributions resulted in Cold War advancements in satellite and microwave technologies. As you walk down the hall from the lobby to the display area, you're invited to check out a series of posters outlining the many developments pioneered at Camp Evans. For one, a satellite designed at Evans was the first to demonstrate the value of these "eyes in the skies" in predicting weather. Apparently, when the satellite sent its first pictures back to earth, a researcher noticed a hurricane formation within one of the images. Scattered about the photographs, signage and display cases are a variety of vintage military equipment, including beacons that were used by Allied spies to help guide U.S. aircraft on supply and bombing missions on overcast days when they wouldn't otherwise be able to drop their payloads. To make a point about the evolution of non-military uses of technology developed at Evans, our guide pointed out a "Hot Wheels" functional radar gun atop one of the displays. More advanced than anything built on site, it's now available in toy stores for less than $100. The next stop on our visit was the Radio Technology Museum and National Broadcasters Hall of Fame. Curated and operated by members of the New Jersey Antique Radio Club, the museum features the evolution of commercial radio and recorded sound, using operating vintage equipment. In an age of MP3 players and satellite radio, club members open visitors' eyes to the days of crystal sets and consoles that required three dials to tune in a station. They've got plenty of sets from the 20s and 30's, as well as phonographs from an Edison cylinder player to a 45 RPM children's record player. Just about every recording medium is there, too, from wire to vinyl, reel-to-reel, cassette, 8-track and CD. The exhibit ends with an assortment of early televisions and a discussion of color TV technology. There's a lot more to InfoAge than I've outlined here, and we'll be returning to share other stories in the future. That said, right now, the site even has something for birders! A portion of the property has been roped off to create a safe radius for a bald eagles' nest. We weren't able to locate the nest or see any of the raptors while we were there, but a passer-by told us she'd seen an eaglet testing his or her wings earlier in the day. That noisy college town: Somerville? The Spirit of 1776, penned in Parsippany.